The Exercise and Cancer SurvivorshipTM continuing education home study course presents the science behind the benefits of exercise for cancer survival and survivorship as well as the application of that science to the design or adaptation of exercise programs for cancer patients and survivors. This course provides evidence-based information to assist health and fitness professionals in using exercise to help cancer survivors with recovery, rehabilitation and reducing the risk of recurrence. The American Academy of Health and Fitness (BOC AP#: P3645) is approved by the Board of Certification, Inc. to provide continuing education to Certified Athletic Trainers. This program is eligible for a maximum of 6.25 Category A hours/CEUs. This continuing education home study course offered to you in a distance-learning format places emphasis on practical application, including the incidence and prevalence of the most common cancers; common cancer treatments and side effects; the benefits of exercise after a diagnosis of cancer; exercise testing, prescription and programming; nutrition and weight management; counseling for health behavior change, and injury prevention. This course will increase health and fitness professionals’ knowledge of the benefits of exercise after a cancer diagnosis as well as the specifics of developing and adapting exercise programs to meet the unique needs of cancer survivors. 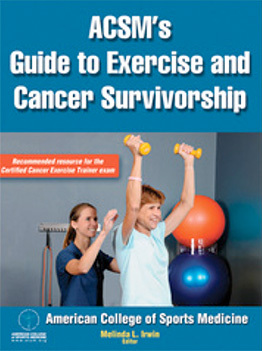 Electronic format — Exercise and Cancer SurvivorshipTM certificate package with online test includes the eBook version of the 208-page ACSM’s Guide to Exercise and Cancer Survivorship Editor Melinda L. Irwin, PhD, MPH (accessed through Adobe Digital Editions/BlueFire Reader) and a 74-page workbook provided in PDF format. Instructions for completing the 60-question multiple-choice online test and obtaining CECs are also included in PDF format. Note: This course package is made available for immediate access and download after purchase. All materials for this electronic format course are available electronically. Nothing is mailed. Discuss the general epidemiology of cancer, common screening practices, treatment strategies, and warning signs for recurrence. Identify side effects, signs, and symptoms associated with common cancers and treatment strategies. Explain and distinguish between lifestyle and heredity factors that influence mechanisms of cancer etiology. Discuss the physiologic and psychological attributes and benefits that may be improved by exercise training among cancer survivors. Obtain basic and medical history from cancer survivors and recognize how cancer and its treatments may affect components of fitness and fitness testing results. Describe the benefits and risks of safe exercise training in the cancer survivor, as well as possible exercise prescription/program modifications. Discuss the effects of cancer treatments on the nutritional health and needs of cancer patients and survivors. Identify and explain behavioral strategies that can enhance exercise and activity motivation and adherence for cancer patients and survivors. Recognize and respond to cancer-specific safety issues and emergencies, as well as complete incident documentation related to cancer-specific adverse events. Discuss essential operation, administration, and management roles and tasks within a cancer center, cancer treatment facility, and outpatient setting.